This was the first of two trips we made with Melody Kehl of Outdoor Adventures, a company specializing in hiking, birding and nature walks and based in Tucson. We had done a web search looking for this sort of company/person and Outdoor Adventures looked good so we'd contacted them by e-mail a couple of months before the trip. We were not to be disappointed. At 6.30am Melody arrived at the ranch driving a huge Oldsmobile (which we later discovered was named the Queen Mary). Melody recommended that instead of heading south as we had first thought we should head north to Mount Lemmon because ascending the mountain would allow us to cross four or five different habitat zones. The first zone is, of course, the desert. Driving from the ranch we saw the usual desert species plus Purple Martins on telegraph wires. The first site Melody was aiming for is north of Tucson - a place called Agua Caliente Park. The park comprises a group of lakes surrounded by trees and reeds. It opens at 7am and we were a bit early so we had a quick look through the fence, getting Mallard and a female Ring-necked Duck. Rather than wasting valuable birding time we headed off to Mount Lemmon. We had barely begun the ascent of the mountain when Melody stopped the car by a dry wash which was well populated with small trees and shrubs. This sort of habitat is good for birds migrating through Arizona towards their summering grounds in the north. We had one only bird here but it was a bird we hadn't even considered as possible for us to see and which was of a genus I had wanted to see for years. Helen and Melody saw it first and I missed it as it flew deeper into the bushes. Helen said it was an Oporornis warbler which made me even more desperate to see it. A short time later the bird appeared again, moving quickly around the lower parts of the bushes. After a few brief glimpses I finally managed a good look, saw the split eye ring and realised we were watching a MacGillivray's Warbler. We couldn't have imagined a better start to the day. The road soon became steeper as we ascended onto the mountain. To our right was a steep precipice with a view over a valley and, in the distance, Tucson. Wheeling over the chasm were at least two White-throated Swifts - we hoped to see these better later on. Our next stop was just after the saguaros had disappeared. The land was rocky with few shrubs. The first birds here were a singing male Black-headed Grosbeak, a Gray Flycatcher and a Blue-gray Gnatcatcher. All very nice but not what we were here for. We walked/climbed down a steep path towards the base of a canyon (getting numerous cacti spines stuck in my legs on the way). On the descent we had a fine male Summer Tanager, on an Ocotillo, right in front of us, and Broad-tailed Hummingbird and Dusky-capped Flycatcher. 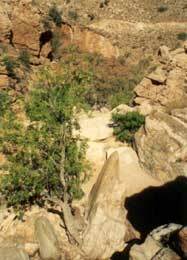 At the lowest part of the canyon, where water flows (when there is water) there grow lots of trees and shrubs. We sat for a while listening to strange calls from Cooper's Hawks, a displaying male Costa's Hummingbird and Bell's Vireo. Also heard here was our target bird but seeing one was another matter. In the trees we did see Lesser Goldfinch, Rufous-crowned Sparrow, House Finch and Broad-billed Hummingbird. We began the ascent of the canyon, up where water sometimes flows. Despite quite a lot of shade, climbing a canyon is a good workout, although frequent stops for birds are, of course, essential. As we climbed we heard at least two individuals of our target bird, sounding similar but different. About half way up we stopped and Melody managed to find the bird. As she did it dropped behind a rock, again after Helen had seen it (albeit briefly). A bit of patience was soon rewarded with good views of a male Canyon Wren feeding across the canyon and occasionally singing for us. This was a bird we both really wanted to see and hear - could the day get any better? Next stop was further up the mountain at Molino Basin (elevation 4370 feet), where the habitat comprises oak woodland. Oaks = acorns = hoped-for Acorn Woodpeckers. Melody was confident! We parked and had to look for at least 10 seconds before a party of Acorn Woodpeckers arrived. They kindly sat on open branches, on leafless trees, about 10 metres away. Another major bird for us, and the best-looking woodpecker we were likely to see. Walking through the oak woodland we came to an area of more open land. This was a site for our next target bird which we soon heard singing but couldn't immediately find. As we searched we had Bewick's Wrens, Cordilleran Flycatcher, Sharp-shinned Hawk, Cassin's Kingbird, Turkey Vulture, a fine male Anna's Hummingbird showing his pink head in the sun and a surprise find of Loggerhead Shrike. As we searched the nearby and distant bushes I saw a bird flying across the path and shouted 'Scott's Oriole'. The bird landed on top of a large oak and allowed me to 'scope it as it sung. Another major target now in the notebook. Having had ace views of the oriole we headed back towards the car. En route we added Chipping Sparrow, Bronzed Cowbird, a pair of Summer Tanagers, Gambel's Quail and Blue-gray Gnatcatcher. Back in the oak woodland we added White-breasted Nuthatch, more Acorn Woodpeckers, and a pair of Hepatic Tanagers. Next stop was the Gordon Hirabayashi Recreation Site. This was just a quick stop where we got two Rufous-crowned Sparrows, Warbling Vireo and a nice male Townsend's Warbler. No time to hang around. We drove up to where pines became the predominant vegetation and stopped by the side of the road when Melody heard a Spotted Towhee. We heard this bird well, and knew where it was, but could we see it? A male Black-throated Gray Warbler put in an appearance but the towhee remained elusive but loud. Melody thought she heard an Arizona Woodpecker so we moved into the wood a bit. Whilst the girls looked for the woodpecker I continued looking for this towhee. Finally I found it, almost at the top of a large pine, still singing. We saw the bird relatively well from the front and below but didn't see the spots on its back. A short distance further on we stopped at Bear Canyon Picnic Area, another area of pine woodland. First we found Townsend's Warblers, then our first male Hermit Warbler. We heard and saw both Hutton's and Cassin's Vireos and heard Spotted Towhee. A short walk up the hill added at least two noisy Pygmy Nuthatches and we heard a distant Greater Pewee. Back at the picnic area we added 4 or 5 Bushtits (no Black-eared versions though). Also here we had Northern Flicker and American Robin. Next stop was a short way up the road to another part of Bear Canyon. First bird here was Yellow-eyed Junco, a pair showing well. A great-looking bird with a most obvious yellow eye. The juncos fed near the ground and as we looked higher in the tree we found a Bridled Titmouse, another new bird. Also here we had Yellow-rumped Warbler and saw a tree used by Acorn Woodpeckers to store their acorns - a good few thousand holes were visible. The road to the top of the mountain was not all accessible due to roadworks widening it. Our highest site was Rose Canyon where we intended to have lunch. First we had to do a spot of birding. Within a minute of getting out of the car I found a Red-faced Warbler showing well in a low bush by the side of the road. We thought Red-faced Warbler would be hard to get. We watched this for a few minutes then Helen spotted a Western Bluebird above our heads sitting in a tree. Hard to get good views but the red and blue could be seen. We decided to walk down the road towards Rose Canyon Lake. On the way down we had Yellow-rumped Warbler, Black-headed Grosbeak, Hermit Thrush, Broad-tailed Hummingbird, Black-throated Gray Warbler, Violet-green Swallow and House Wren. We didn't visit the lake, which is more for fishermen, and walked back up the road to the car. We took the car down the road to a picnic area. Before lunch we walked around and got great views of a fine male Grace's Warbler, plus Acorn Woodpecker, Red-faced Warbler, Warbling Vireo, Black-chinned Hummingbird, American Robin, Brown Creeper and Yellow-eyed Junco. We walked back up the road to find a singing Western Tanager we'd heard as we drove past earlier. As we sat eating lunch two Magnificent Hummingbirds put in a brief appearance and another male Western Tanager showed well in a nearby tree. After lunch we walked further down the canyon, mostly along the edge of a wash. Here we hoped to get Painted Redstart, a bird which seems to now be extinct (based on us not seeing any anywhere, whilst we were in Arizona). We did get Pygmy Nuthatch, more Red-faced Warblers, a nice Plumbeous Vireo, a stationary Cooper's Hawk and heard Hairy Woodpecker. Unfortunately it was now time to work our way back down the mountain. We again stopped at Bear Canyon, this time getting a party of adult and young Mexican Jays. These birds obviously were used to people feeding them and were disappointed we didn't have any food to give them. They did check us out closely though. Acorn Woodpecker, Chipping Sparrow, White-breasted Nuthatch and Yellow-eyed Junco were also seen here. We stopped again at the first picnic area of Bear Canyon which was rather quiet. We did get Pygmy Nuthatch, White-breasted Nuthatch, Mexican Jay, Plumbeous Vireo, Spotted Towhee, Acorn Woodpecker, Hermit, Yellow-rumped and Townsend's Warblers and heard the Greater Pewee again. Later a sudden stop due to distant soaring birds yielded more TVs and a probable Zone-tailed Hawk (we weren't too worried about this latter bird – see Bellota Ranch). Back at Gordon Hirabayashi Recreation Site we had Dusky-capped Flycatcher, Summer Tanager and our first Rock Wren, which kindly flew over to us and showed well on a rock. Finally, we went back to Agua Caliente Park. We walked around the lakes getting Mallard, including at least two 'Mexican Ducks', Red-winged Blackbirds, a Great Blue Heron, Lucy's Warbler, Gambel's Quail, Verdin at the nest, displaying Great-tailed Grackles, Gila Woodpecker, Curve-billed Thrasher, Mourning Dove, Wilson's Warbler, Phainopepla, Chipping Sparrow, House Finch, Vermilion Flycatcher, Common Yellowthroat, American Coot, two pairs of Ring-necked Ducks, Cassin's Kingbird, Black-chinned Hummingbird, Northern Rough-winged Swallow, White-winged Dove, Costa's Hummingbird and Ladder-backed Woodpecker. As we drove back to the ranch Melody took us on a somewhat extended route to find our final lifer of the day. I spotted one on a telegraph pole and we screeched to a stop. At last, a bird we thought would be easier to get, a Harris's Hawk, was found. It soon flew and joined another to disappear behind some trees. Then back for dinner with 85 species seen of which 27 were lifers (including Harris's Hawk seen in Tucson).